The UK Domestic Renewable Heat Update from Green Business Watch analyses activity under the Domestic RHI and looks at the how the scheme has impacted the domestic renewable heat market. The report analyses the most recent application figures which cover installations from the launch of the scheme to the end of August. The Domestic Renewable Heat Incentive (Domestic RHI) launched on April 9th 2014 and is a UK Government scheme to encourage the use of renewable heating technologies. Under the scheme, householders receive quarterly payments for a period of 7 years based on the amount of renewable heat their system produces. 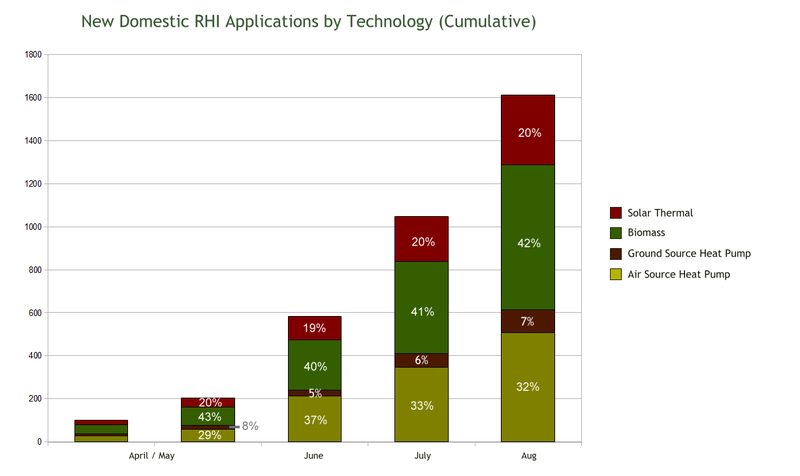 The Domestic RHI has seen impressive application numbers in a very short time with 9,963 applications in less than 5 months. Impressive activity levels in the scheme should not be confused with activity levels in the market. Only 16.2% (1,611) of the applications are for installations that took place since the launch of the scheme. New installations were quite slow in the initial months of the scheme. This is probably to be expected given the scheme and its procedures are new and there is a lead time from decision making to scheduling and installing. It is a very positive sign that the number of installations applied for under the scheme have been increasing month on month and this trend continued in August. Since the launch of the scheme on 9th July, Biomass has accounted for 42% of the installations. When we look at legacy applications (for installations from July 2009 – March 2014), Biomass accounted for only 17% of these. Biomass continues to do very well from the Domestic RHI. Air source heat pumps have been the dominant domestic renewable heating technology over the last few years and account for 38% of legacy applications to the Domestic RHI. Air source remains strong and is the second most popular technology since the launch of the scheme with 32% of new applications. 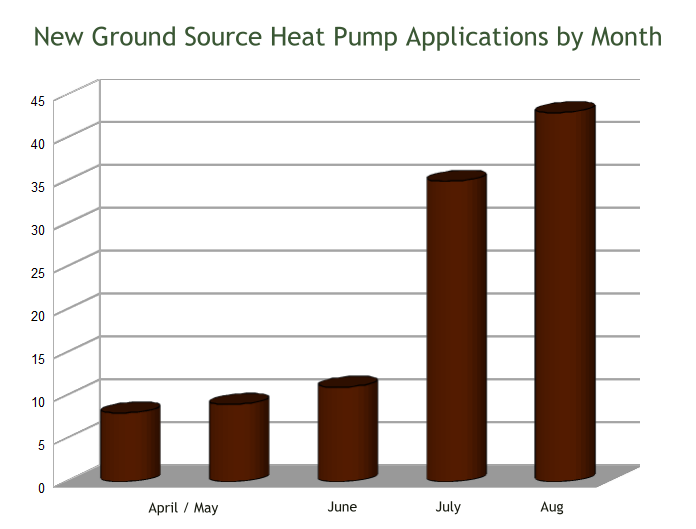 Both ground source heat pumps and solar thermal are accounting for lower percentages of the installations when new installations are compared to legacy ones. 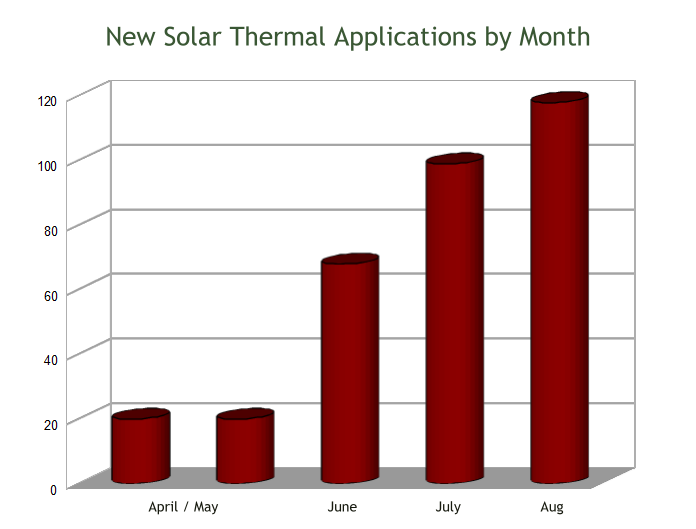 It is far from all bad news for these technologies however, and both of them are continuing to grow month on month under the scheme.